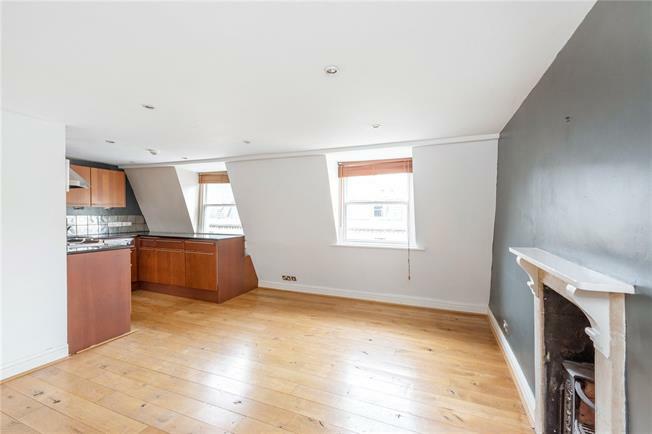 1 Bedroom Flat For Sale in Bath for Guide Price £325,000. The property is approached from the street level with entry phone system to a communal hall and stairs ascending to the top (third) floor. Within the hallway there are two communal storage cupboards on the half landings. The private main hall has access to a loft and a cupboard housing the electric, pressurised heating system. The south facing sitting room has an ornamental fireplace and oak floor which continues into an open plan kitchen area. Fitted with mahogany cabinets under granite worktops, appliances include two Smeg twin ceramic hobs under a stainless steel cooker hood with oven below, a slim-line dishwasher, refrigerator and a washing machine. With two south facing windows to the front ample light is provided to this flexible room. The bedroom is located at the rear with a further ornamental fireplace, served by an internal bathroom with mixer tap and shower fitting to the bath with side screen. There is full height tiling to two walls. The situation and architecture of Brock Street and its famous neighbours confirms that it is one of Bath's prime residential locations of great historical importance and ambience. This super location is ideal for those who wish to be able to walk into the city and enjoy the unique boutiques, bars and restaurants close by as well as the wonderful Royal Victoria Park. For the commuter, Junction 18 of the M4 is 10 miles to the north and Bath Spa railway station receives the high speed service (approximately 90 minutes) from London Paddington. Bristol Airport is a twenty mile drive away offering excellent communications to inland and European destinations. The World Heritage Site offers an amazing array of cultural, sports and art activities. Bath Horse Racing Course is found to the north off Lansdown just beyond the Lansdown Golf Club, one of many in the vicinity. There are delightful walks along the river Avon and Kennet & Avon Canal which flow through the city. Services: Mains connected electricity, water and drainage. Council Tax Band C.
Leasehold: 999 years from 25th March 1986. Service Charge: £1087.40 paid twice yearly. Ground Rent: £40 per annum.